Durable 12 gauge steel platform, with underbracing, and 12 gauge caster mounts for long lasting use. 6 removable 1 1/4â€� tubular dividers with smooth radius bend for safety and uniform appearance (see options). Standard 2 each: 12â€� high, 24â€� high, 36â€� high. 7 divider pockets (each end). 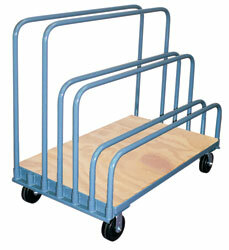 Platform flush for easy load and unload. Durable 12 gauge steel platform, capped with 3/4" varnished plywood.